Down in the valley from Vienne and up through the hills lies the vineyard of the Côte Rôtie. 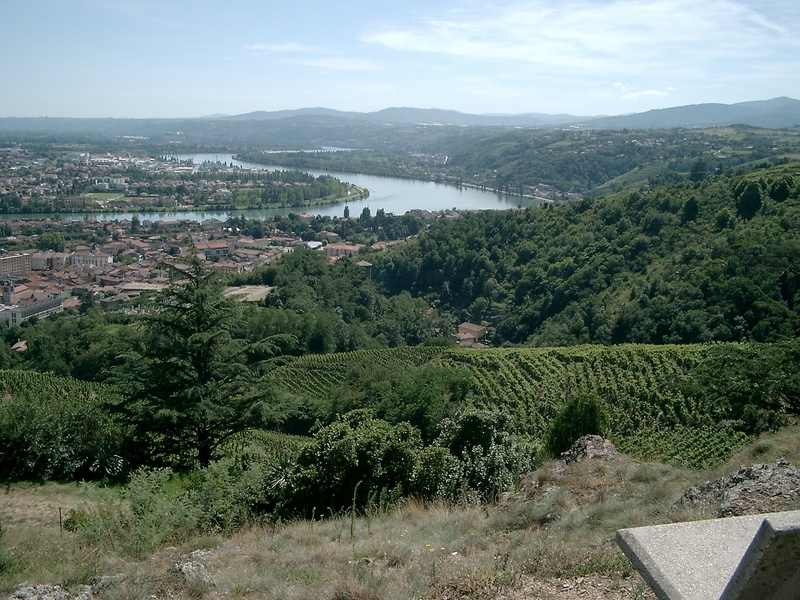 The AOC Côte Rôtie extends over 235 hectares on the right bank of the Rhone, just south of Lyon, near Vienne, onto three different towns: Ampuis, Saint-Cyr-sur-Rhône, and Tupin-Semons. 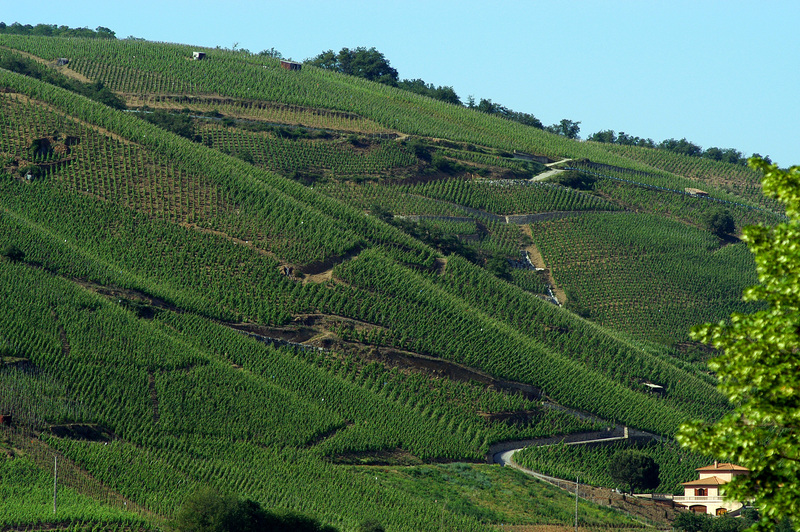 This vineyard, the oldest and most northerly of the Côtes-du-Rhône, now recognized for the exceptional quality of its wines, almost disappeared in the nineteenth century due to its difficult access. Indeed, it is located in narrow terraces built on steep hillsides with steep slopes. But it is precisely these very typical culture conditions that have produced great wines in a climate that perfectly combines the warmth and sun (hence the “Rotie” or Toast in English) Mediterranean climate, with the freshness and humidity produced throughout the year by the continental influences of Burgundy lands further north. 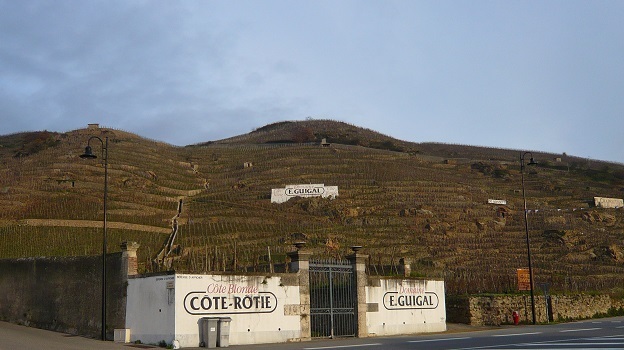 In Côte-Rôtie, there are two distinct terroirs: Côte Brune north with a soil rich in iron, and Côte Blonde south, composed of sandy clay called “arzels”. Raised slowly in wood barrels, the Côte Rôtie are red wines of admirable quality, intensely complex, tannic and powerful, prized for its authenticity and richness on the palate. The typical grape variety in the northern Rhône Valley is the Syrah that gives wines a raspberry and violet notes in their youth, revealing subtle vanilla flavors with age. 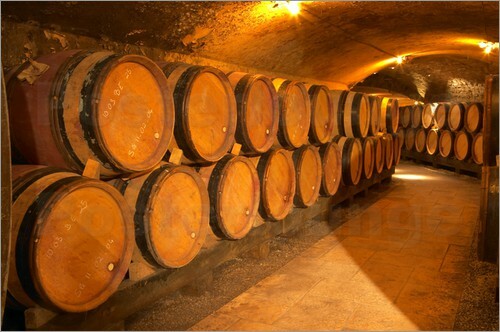 One of the largest winery is E. Guigal. My grand father used to grow grapes for the winery. Each September during harvest time, I spent countless hours running in the cellar. Make the stop, you won’t regret it. There is no need to buy the wine. It can be found in the U.S. unless you are looking at buying some of the higher end ones. Then go ahead. Vidal-Fleury is the oldest winery of the valley. Built in 1781, it is still running today. In 2008 a new cellar was built just outside the village of Ampuis at the foot of the terraces. Contact in advance if you want to visit. It is a smaller operation. Domaine P. and C. Bonnefond is a small family vineyard of 6 hectares run by two brothers. The work is exclusively manual (harvest included) to obtain wines that are perfectly representative of the character of the soil. Only visit by appointments. Tell them I sent you! There is a multitude of additional family run wineries all along the valley. Domaine Barge, Domaine Jean Michel Gerin, Domaine Clusel-Roche, Domaine Garon, just to name a few. The primary accommodations you’ll find are home stay. There is a little 12 guestrooms hotel that opened a few years ago just outside the village of Ampuis called the “Domaine des Vignes” with incredible views of the vineyard. How to travel with wine bottles? 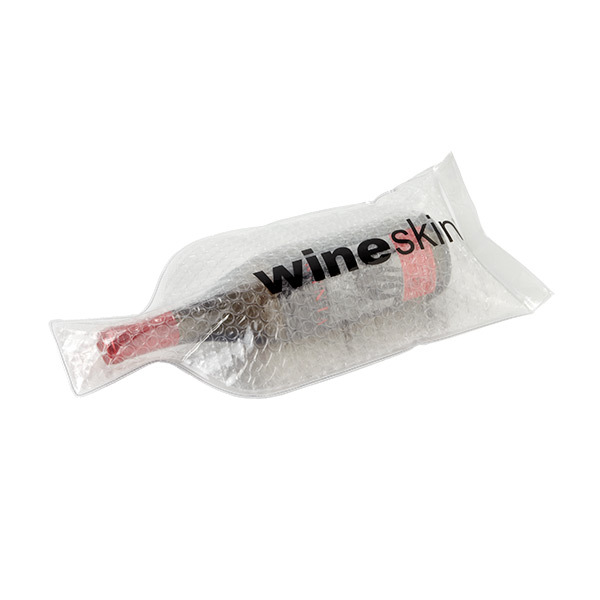 We used WineSkin Bottle Transport bag. Bottles were individually wrapped into the bag and stored in our suitcases. They all came back in one piece (10 bottles). Score! As a rule of thumb I always declare what I bring back to avoid any issues. But there is an $800 Exemption rule. If you are arriving from anywhere other than a U.S. insular possession, you may bring back $800 worth of items duty free, as long as you bring them with you. This is called accompanied baggage. That said, you still need to obey the rules of the airlines and weight can be an issue, so think about how to pack before you leave. Have fun and drink reasonably.